Last spring, I had the chance to travel to Nashville, Tennessee. It was my first time in Music City and it was wonderful to soak up all the local history. From restaurant menus heralding popular songs bought for a beer tab, to a Sun Records location where R.E.M. recorded, to a visit to the Johnny Cash Museum, it was a visit steeped in musical lore. We spent a couple of hours among the Cash Museum’s exhibits. There were clothing displays, Johnny’s childhood report cards, a section dedicated to his movie appearances, and guitars galore. What struck me most was the sheer volume of the man’s output during his recording days. 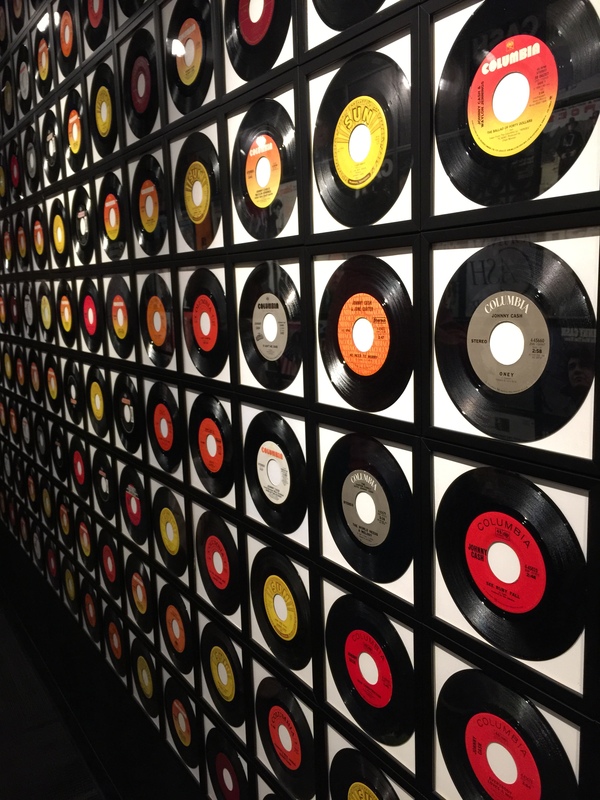 At one juncture in the museum, visitors travel a hallway featuring dozens of his album covers on one side, and singles on the other. The effect is quite stunning: at a glance you can absorb just how prolific Cash was as a recording artist. What do you think of when you think of the word, “prolific”? If spring has arrived where you live, maybe the plethora of dandelions sprouting in your neighborhood might fit. If you’re in the Southern Hemisphere, it might be the leaves falling from the trees. Your response need not be one based in nature — let your imagination fuel your camera. Looking for advanced customization, the ability to sell online, and SEO tools? Find the WordPress.com plan that’s right for you. That’s a lot of vinyl! Makes for a great photo, too. You sent me outside to photograph my rose bush this morning. Must have been a great visit! Here’s my entry – round too, in a way, but not the same kind of music! Hi everyone. Here is my submission for this week. Take a good look at those hanging dollar bills! I had stapled 45 rpm record like these to my ceiling in my first apartment. It was fun. Your photo brought back those memories. Nice photograph …. pauses&clicks Everything Has Gone To The Dogs! Prolific: Flower Parade 4 (Pegasus) – What's (in) the picture? Photo Challenge: Prolific – It's Mayur Remember? Reflections On Earth Day – Slow down. Take a breath. Take a photograph. Po' Girl Shines Weekly Photo Challenge: Prolific or Obsessive-Compulsive? CountyGardening Why disparage the ditch daylily? Prolific: Flower Parade 3 (Cow and Milkmaid) – What's (in) the picture? Weekly Photo Challenge: Prolific – These aren't gray hairs, these are highlights! ~106-112 Of 365~ – ……….365 Days………..
Angela's corner Guinness Record for the world's biggest cajon performance- Weekly foto challenge : Prolific. Prolific: Flower Parade 2 (Buzz Lightyear) – What's (in) the picture? Prolific… – 50 First Dates With Myself! Prolific: Flower Parade – What's (in) the picture? Pics by Kaz Random Fridays: I’m glad they’re small! Aditi Universe They Are Coming! All About Nahargarh Fort Sunrise Experience – Jaipur Thru My Lens !! Prolific: Johan Cruyff Arena – What's (in) the picture? Prolific: Daffodils – What's (in) the picture? The Eye of a Thieving Magpie Can You Explain a Prolific Robin? The Music. – THE ABSTRACT MIND. The Rising Comet – Akin Brown – THE ABSTRACT MIND. A few Black-headed Gulls. – David M's photo blog. Surprising Lives Prolific Peace With Beautiful Rain GIFS. 👻 Mossy Mausoleum 👻 – What if We all Cared? Prolific, really? – Oh, border! Prolific: Rain – What's (in) the picture? Giggles & Tales Weekly Photo Challenge – Prolific! Ouch!! My back hurts!! Prolific – Storytelling! Prolific Snow Geese. – David M's photo blog. Reflections on the river So many little things..
the15thday benefits of a beautiful view!